Karolinska Development intends to restructure the convertible bonds, due to mature in December 2019. The proposal would materially strengthen the balance sheet and allow full implementation of the revised investment strategy. Additionally, in our view, it would remove what has been a distraction for management and a major overhang on the share price. Our valuation of Karolinska Development, based on its four main assets, was SEK 473m(SEK9.10 per share) and is placed under review pending the outcome of the offer. Proposal to convert debt into equity Karolinska Development has announced its intention to offer to issue new B shares to its convertible bond holders. The voluntary agreement would see the new shares issued at the higher of the VWAP (volume weighted average share price) of the 90 trading day period ending either two trading days prior to the announcement, which is SEK 6.17 per share, or for the two trading days before the EGM on 8 March. The actions of CP Group will determine outcome CP Group holds 70.53% of the convertible bonds and a further 9.08% of the equity. If CP Group were to set off all of its convertible holdings to B-shares its total holding would exceed the 30% threshold of the voting rights and would be obliged to launch a mandatory bid. CP Group could apply for exception for this requirement but it is unknown if this would be allowed by the Swedish Securities Council. The transformation is nearing completion We view the offer as marking the closing stages of the major transformation that has been underway at Karolinska Development over the last 24 months. New management has overseen the restructuring of the business, with significant strategic changes to the investment philosophy, the introduction of a greater commercial focus, and the rationalisation of the company portfolio. 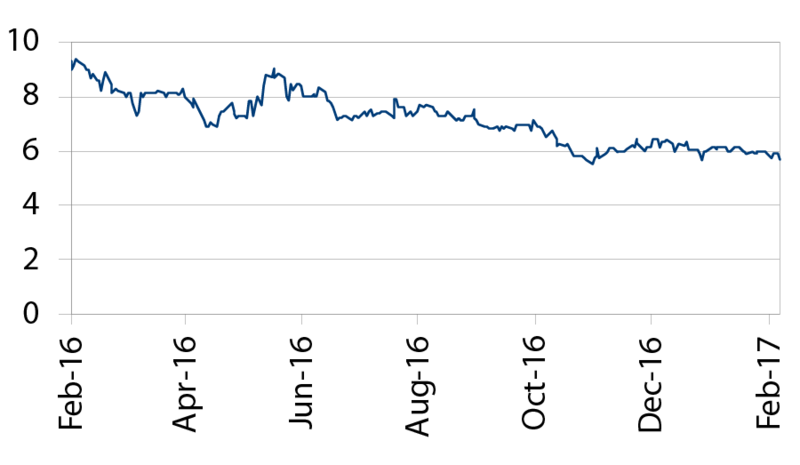 Share price hampered by this overhang Our DCF valuation of Karolinska Development was SEK 473m (SEK9.10 per share). This is a conservative valuation based on the investments in Aprea, OssDsign, Modus Therapeutics, and Promimic, with upside from the other six investments and earn-out agreements. This has been placed under review pending the result of the EGM and the outcome of the proposed conversion. Karolinska Development has made an offer to issue new B shares through a set-off arrangement to its convertible bond holders. The intention is to strengthen its equity position to allow it execute its revised investment strategy, so enabling future investment in promising new companies, as well as maintaining compliance with the Swedish Companies Act (Aktiebolagslagen). The step marks the final stages of the major restructuring that has been underway over the past two years. New management has revitalised the company, with material changes to the investment philosophy, the adoption of a greater commercial outlook, and the creation of a more focussed portfolio. Karolinska Development has announced its intention to offer to issue new B shares to its convertible bond holders though a set-off arrangement. The voluntary agreement would see the new shares issued at the higher of the VWAP (volume weighted average share price) of the 90 trading day period ending either two trading days prior to the announcement, which is SEK 6.17 per share, or at the two trading days period before the EGM (8th March 2017). 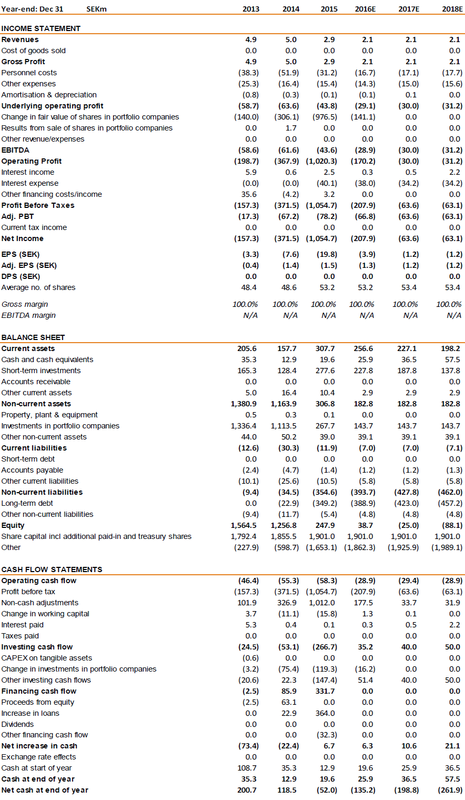 The balance sheet is sound and has funding in place for the known investment and operational needs, with SEK 256.3m in cash and equivalents at September 2016. However, the equity position needs further strengthening to execute on the investment opportunities that are now presenting themselves and to continue to comply with the Swedish Companies Act (Aktiebolagslagen). The full conversion of the bonds would move Karolinska Development from a net debt position of SEK 127m to a net cash position of SEK 256m. As background, in January 2015 a convertible bond with a nominal amount of SEK 387m was issued. These bonds are listed on Nasdaq Stockholm (ISIN: SE0006510103) and carry an annual interest rate of 8% over a term of 5 years. The outstanding amount, including interest, is approximately SEK 451m as of 31 December 2016. These can be called for conversion into B-shares up until 30 June 2019 at a price of SEK 22.00. 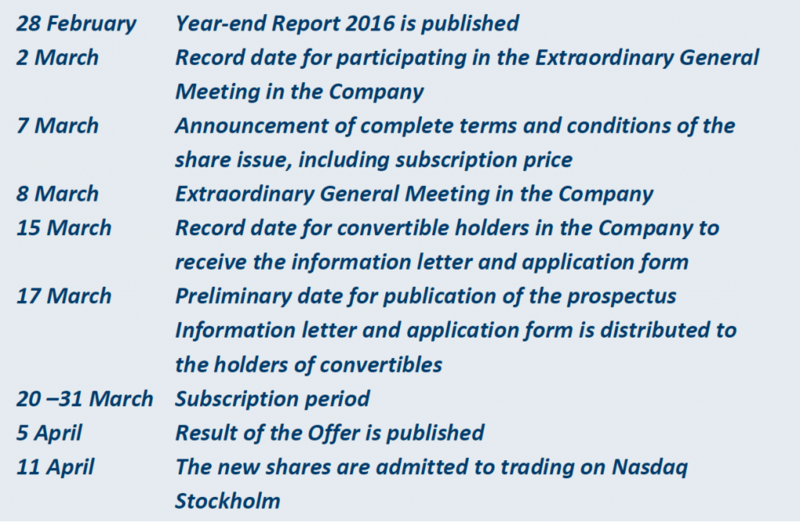 Assuming these are held to maturity with the interest accrued, the amount repayable would be SEK 568m with 25.8m new shares issued. CP Group holds 70.53% of the convertible bonds and a further 9.08% of the equity (representing 7.24% of the votes). These are held indirectly via Sino Biopharmaceutical Limited and its subsidiaries. If CP Group were to set off all of its convertible holdings to B-shares its total holding would exceed the 30% threshold of the voting rights and would be obliged to launch a mandatory bid. CP Group could apply for exception for this requirement but whether this will be done or would be allowed by the Swedish Securities Council is as yet unknown. A number of scenarios could arise. If all convertible holders accept the offer, this would result in a set-off of SEK 451m of the outstanding convertible debt and CP Group would hold 44.58% of the capital and 40.27% of the voting rights. If CP Group were the only convertible holder to accept the offer, this results in a set-off of SEK 318m of the outstanding convertible debt and CP Group would hold 53.72% of the capital and 47.59% of the voting rights. If CP Group were to keep their holding just below the 30% threshold and assuming that all other convertible holders accept the offer, the maximum amount that can be set off will be SEK 324m. If CP Group were the only convertible holder to accept the offer and wants to keep their holding below the 30% threshold the maximum amount that can be set off will be SEK 134m. The offer is subject to shareholder approval and an EGM is scheduled for 8th March 2017, with a two thirds majority required. If all convertible holders were to accept the offer a maximum of 73.1m new B shares would be issued (based on SEK6.17 per share), with a corresponding dilution of 58% for the B shares and 52% for the voting rights. If the resolution does not pass, the convertible debt, with an exercise price of SEK22 per share and value of SEK 568m, would have to be repaid in December 2019. We have placed our valuation under review pending the result of the EGM and the outcome of the proposed conversion. We previously valued Karolinska Development at SEK 473m (equivalent to SEK9.10 a share). We employ a sum-of-the-parts valuation of its four leading investments (Aprea, OssDsign, Modus Therapeutics, and Promimic), which are valued using DCF-based methods, including rNPV models for the biotech investments and three-phase DCF valuations for those with marketed products. We have examined the possible impact on the proposed debt to equity conversion and have detailed four potential scenarios in Exhibit 2. The likely outcome is particularly difficult to assess, with the number of variables greater than is typical in such cases (notably whether CP Group will seek exception from the mandatory 30% threshold and whether the Swedish Securities Council will grant it), nonetheless the scenarios used do provide a useful point of reference.